What: The 2012 Lough Carra, Ireland project will investigate Holocene climate, aquatic productivity, and pollution records by collecting and analyzing lacustrine carbonate sediments. In addition, we will verify the fidelity of the marl delta 13C record by conducting a series of pore water incubation experiments. The summer program will consist of fieldwork in Ireland and laboratory analyses at Amherst College and Wesleyan University. Where: 10-day field session in Lough Carra, Ireland then ~2.6 weeks at Amherst College and Wesleyan University. This project involves a return for the PI to a marl lake that has within it a record of sedimentation that spans the Holocene. Previous expeditions were limited to short push cores, but the 2012 trip will include long piston cores from the deepest section of the lake, expanding both the quality and duration of the sedimentary record. In addition, on-site use of membrane-inlet mass spectrometry (MIMS) technology allows for a far more detailed understanding of biogeochemical processes that may complicate sedimentary paleoenvironmental interpretations. Carbonate sediments from lacustrine environments have provided long term records of climate and land-use changes through the use of geochemical and biological proxies such as stable isotopic data, trace metal concentrations, faunal assemblages and pollen analyses. More specifically, the oxygen isotope composition of carbonate minerals precipitated via biological mediation is assumed to be in near isotopic equilibrium with delta18O of lake water and the delta 13C of the DIC pool. In lakes with good drainage (~relatively short residence times) the delta18O marl values reflect the isotopic composition of the meteoric precipitation, which is directly related to mean annual temperature. The marl delta 13C values reflect lake water delta 13C values, which, in turn, are controlled by lake productivity, inflowing water delta 13C values, and exchange with the atmosphere. Sediment concentrations of Hg, Pb, Cu, Cr, and Zn record anthropogenic activities and preserved invertebrate and pollen assemblages reveal vegetation and water quality changes. Overall, carbonate lake deposits can provide excellent long-term paleoenvironmental records, but careful interpretations of these proxies is necessary since post-depositional processes may significantly alter the signal and result in misleading conclusions. The Paleoclimate Record of Lough Carra from the Last Glacial Maximum (LGM) to the Present: Using delta 13C, delta18O, and trace element chemistries (Ca/Mg) of carbonate marl sediments we will build a record of climate change for the Lough Carra region. Sediment ages and accumulation rates will be determined from 14C, 210Pb, pollen analyses, and radiogenic isotope measurements on carbonate minerals, organic matter, or tephra deposits. One main goal will be to better constrain the timing of deposition. Keck students will use the University of Massachusetts Stable Isotope facility for carbon and oxygen isotope analyses. Trace elemental composition of carbonate for climate signals and identification of ash falls will be analyzed using the ICP-OES at Amherst College. The Paleoproductivity Record of Lough Carra. A Holocene record of paleoproductivity will be constructed by combining combining organic and inorganic carbon concentrations, C/N ratios, and organic matter delta 13C and delta15N measurements with bulk sediment accumulation rates (g/cm2/yr) based on bulk densities and linear sedimentation rates. The paleoproductivity record is crucial to the interpretation of the delta13CCaCO3 record. Recent sedimentation will be used to document cultural eutrophication and older sediments will supply materials for delta13C calculations, thus determining any changes in lake water delta13CDIC. Sedimentation rates and age models will be constructed from 210Pb, 14C, and/or U-Th measurements of suitable materials. Metal Loading History of Lough Carra. Anthropogenic metal pollution has increased dramatically since the Industrial Revolution. Some metals, such as Pb and Hg, have experienced a rise in global atmospheric deposition since the dawn of metallurgy. A record of Roman mining is recorded in a marl lake in the Aran Islands, western Ireland (Schettler and Romer, 2006). Pollution histories of Cd, Hg, and Pb have been found in ombrotrophic peat bogs near Galway and show distinct peak concentrations over the course of industrialization since the mid-1800s (Coggins et al., 2006). Metal concentrations in lake sediments will aid in determining sediment chronologies as well as narrate the environmental legacy of the “anthropocene”. Students will compile a sediment metal data set by analyzing marl sediments by ICP-OES, XRF, and direct mercury combustion techniques. Carbonate Diagenesis of Marl Lake Sediments. Calcite saturation states and pore water measurements will allow us to evaluate potentially rapid carbonate recrystallization processes that may shift delta13CCaCO3 values in Lough Carra sediments. Sediment pore waters will be analyzed for pH, DIC concentration, delta13CDIC, Ca+2/Cl–, PCO2, and PCH4. Solutes concentrations will be determined by standard analytical techniques, delta13CDIC aliquots will be sampled in Exetainers and analyzed at the UC-Davis Stable Isotope Facility, and gas partial pressures will be determined in whole cores by membrane-inlet mass spectrometry (MIMS; Lloyd et al., 2002). In addition, closed-system sediment incubation experiments will allow us to track carbonate dissolution / precipitation and delta13CDIC during early diagenesis. To help identify specific organic carbon and carbonate precipitation mechanisms, 13C-enriched organic matter or DIC will be added to a series of incubations and tracked by MIMS. Students will be collecting lake waters and sediments on boats or coring platforms. All students are required to be proficient at swimming. Previous coring experience and analytical instrumentation experience is preferred. Lodging in Ireland will consist of a rustic bed-and-breakfast and lodging at Amherst or Wesleyan will be college housing. Students should have some combination of hydrogeology, geochemistry, and/or sedimentology coursework. Students with interests in isotope geochemistry or with strong chemistry backgrounds are encouraged to apply. Coggins, A.M., Jennings, S.G., and Ebinghaus, R., 2006. Accumulation rates of the heavy metals lead, mercury and cadmium in ombrotrophic peatlands in the west of Ireland: Atmospheric Environment, v. 40, p. 260-278. Lloyd, D., Thomas, K. L., Cowie, G., Tammam, J. D., and Williams, A. G., 2002. Direct interface of chemistry to microbiological systems: membrane inlet mass spectrometry: Journal of Microbiological Methods, v. 48, p. 289-302. Schettler, G., and Romer, R.L., 2006. Atmospheric Pb-pollution by pre-medieval mining detected in the sediments of the brackish karst lake An Loch Mór, western Ireland: Applied Geochemistry, v. 21, p. 58-82. WHAT: A study of enigmatic rocks and ancient soils associated with the huge eruptions of the Miocene. WHERE: Our field area is in northeastern Oregon near the Grande Ronde River. We will be in these locations: (1) orientation at Whitman College in Walla Walla Washington, (2) two weeks of camping along the Minam River in northeastern Oregon and field work in the nearby mountains and valleys, (3) return to Whitman for preliminary analysis and sample preparation, and (4) XRF, ICP, and other analysis at Washington State University in Pullman. WHO: Six students, and Professors Kirsten Nicolaysen (Whitman College), Nick Bader (Whitman College), and additional help from Mark Ferns (USGS). Northeastern Oregon marks the center of the largest continental eruption of lavas in the Cenozoic (Coffin & Eldholm, 1994). The importance of this Large Igneous Province (LIP) is difficult to overestimate. It completely reshaped the landscape in much of Oregon, Washington, and Idaho. Furthermore, it may also have significantly changed global climate (Sheldon, 2006); atmospheric loading by volcanic gases from bigger LIPs in India and Siberia are associated with the terminal Cretaceous and Permian mass extinctions respectively, the largest extinctions in the Phanerozoic (Wignall, 2001). Distinct changes in lava compositions reveal a protracted Miocene transition from the vast effusion of the Columbia River Basalt Group (CRBG) to the isolated, small volume eruptions of the Powder River Volcanic Field (PRVF) exposed near La Grande, OR. Contemporaneous with the volcanism, sedimentation and soil development hold clues both to the changing climate that affected the erupted lavas and to lengths of the pauses between eruptions. In collaboration with six motivated student researchers, we propose to (1) describe stratigraphic relationships within and between CRB and PRVF lavas and sedimentary interbeds, (2) investigate models for the genesis of the PRVF magmas using mineral and isotopic compositions, (3) augment our understanding of the timing of lava eruption and interflow pauses, and (4) elucidate regional Miocene climatic conditions. The lavas of Columbia River Basalt Group both obscure the underlying late Paleozoic-Jurassic accreted terranes (e.g., Schwartz et al., 2010 and references therein) and provide a defined surface later modified by folding, extensional faulting, and eruption (Figs. 1, 2). Although some CRBG lavas are compositionally as silicic as andesites, most of the 300+ flows are tholeiitic basalt and comprise a volume of ~224,000 cubic kilometers (Tolan et al., 2009 and references therein). In spite of complicating observations (Pierce and Morgan, 2009), mantle melts are thought to be largely responsible for the CRBG. Nonetheless clinopyroxene thermobarometry and isotopic compositions demonstrate that some CRBG lavas stalled in the crust and there assimilated partial melts of crustal material (e.g., Ramos et al., 2005; Caprarelli and Reidel, 2004). Although presumably the Yellowstone hotspot was under eastern Oregon when CRBG flows started effusing at Steens Mountain at approximately 16.6 Ma, the voluminous eruptions were finished by 14.7 Ma (Brueseke et al., 2007; Barry et al., 2010 and references therein). Synchronous with the waning eruptions of the CRBG, the Powder River Volcanic Field (PRVF) eruptions started as early as 14 Ma (Fig. 2; Bailey, 1990; Ferns et al., 2010). Throughout the ~12 million years of volcanism, PRVF lavas erupted lavas with truly diverse compositions, ranging from basalt to dacite and basanite to trachyandesite (Fig. 3; Bailey and Conrey, 1992; Ferns et al., 2010). In addition to being more siliceous and smaller in volume than most individual CRBG flows, PRVF lavas are calc-alkaline to alkaline in composition (i.e., higher in Na2O, K2O, and generally lower in MgO and FeO). These PRVF magma compositions cannot be explained by the same processes that produced the CRBG. A second component of this project is ancient soils or paleosols. Paleosols are affected by processes occurring at the Earth’s surface. After controlling for diagenetic alteration, paleosols can therefore allow us to reconstruct paleoclimates (Sheldon and Tabor, 2009), paleoenvironments (Kraus, 1999) or paleotopography (Takeuchi, 2007) depending upon the variables held constant by the analysis. Because most soils are in actively eroding landscapes, the global distribution of paleosols is sparse compared to the distribution of modern soils. However, widespread aggradation in the volcanically-active Cenozoic landscapes of eastern Oregon has preserved numerous paleosols. Especially well-studied examples include the late Eocene and Oligocene paleosols of the Clarno and John Day Formations (e.g., Retallack et al., 2000), which record the dramatic cooling at the Eocene-Oligocene transition. We will use the paleosols of the CRBG and the PRVF to examine Miocene climate and eruptive history. 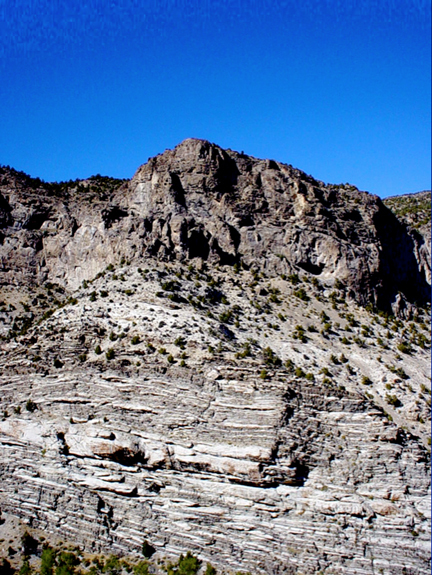 Crustal history of alkaline magmas of the PRVF/EVF (1-2 students): Some small buttes and ridges are interpreted as monogenetic eruptions of trachyandesite and andesite. Investigation of amphibole phenocrysts and pyroxene microphenocryst compositions could reveal crystallization depths and pre-eruptive volatile content. Parental magmas of the PRVG/EVF (1 student): We’ll collect targeted rock samples for Sr, Nd, Pb isotopic analysis and petrogenetic modeling in order to understand the role of mantle melts and crustal contamination in the genesis of the lavas of the Powder River and Elgin Volcanic Fields. Age relationships and post-emplacement extension of PRVF/EVF flows (1 student): The age relationships among the PRVF lavas are crucial to both aspects of the project. This project will focus on argon dating. With the appropriate home-institution adviser, the same student could drill paleomagnetic cores from a stratigraphic sequence of lavas to determine the paleoflow direction or the effect of regional extension on flow orientation. Comparative clay mineralogy and microtexture of paleosols (1 student): This project has two components: a detailed field description and measurement of the Cricket Flats paleosol and a detailed mineralogical comparison of the Cricket Flats paleosol with an older CRBG paleosol using X-ray diffraction. Geochemical analysis of weathering in two Middle Miocene paleosols (1 student): One student will use XRF and ICP-MS analysis of major and trace elements to compare two interesting paleosols developed on different volcanic units. This data will be used to generate weathering indices and reconstruct temperature and moisture profiles in conjunction with the paleosol mineralogy project. Changes in weathering on CRBG flows after the Middle Miocene thermal maximum (1 student): The interested student will use portable XRF to identify promising CRBG paleosols on Minam Grade Road, and collect samples for XRF and ICP-MS analysis at WSU Pullman. The resulting elemental abundance data will be used to reconstruct weathering profiles relative to the parent flow and to relate these soil processes to Middle Miocene paleoclimate. We will be outside for the main part of this project. For several projects we will be walking and sampling on steep slopes that form the sides of deep canyons. Students should have good depth perception, good physical condition, and be comfortable climbing rough ground off-trail. Temperatures may be in the 90’s during the day and the 40’s at night. Rain is unlikely but possible. Rattlesnakes are a possible danger. Our field accommodations will be primitive (tent-based for two weeks) and far from big cities, with vault toilets and no electricity or refrigeration. You will need to bring camping gear for a two-week trip including a sleeping bag and tent. Have clothes for both heat and cold and possibly rain. Sturdy boots are essential, as are standard camping items such as hats, sunscreen, water bottles. You should bring a field notebook, writing utensils, and a hand lens. We’ll provide rock hammers, GPS, Brunton compasses, and other equipment. We’ll be staying in campus housing for part of the time but you will still need your sleeping bags as bedding is not provided. We’ll provide a more complete equipment list later on. Historical geology or sedimentology/stratigraphy; mineralogy and petrology. Courses in soils, geochemistry, and field courses are recommended but not required. Bailey, D.G., 1990, Geochemistry and petrogenesis of Miocene volcanic rocks in the Powder River Volcanic Field, northeastern OR [Ph.D. thesis]: Pullman, WSU, 346 p.
Bailey, D.G., and Conrey, R.M., 1992, Common parent magma for Miocene to Holocene mafic volcanism in the northwestern United States. Geology 20, 1131-11-34. Barry, T.L., Self, S., Kelley, S.P., Reidel, S., Hooper, P., & Widdowson, M., 2010, New 40Ar/39Ar dating of the Grande Ronde lavas, Columbia River Basalts, USA: Implications for duration of flood basalt eruption episodes. Lithos, 118(3-4), 213-222. Brueseke, M.E. et al., 2007. Distribution and geochronology of Oregon Plateau (U.S.A.) flood basalt volcanism: The Steens Basalt revisited. Journal of Volcanology and Geothermal Research, 161(3), 187-214. Caprarelli, G., and Reidel, S.P., 2005, A clinopyroxene-basalt geothermobarometry perspective of Columbia Plateau (NW USA) Miocene magmatism, Terra Nova, 17, 265-277. Coffin, M. F., & Eldholm, O., 1994, Large Igneous Provinces – Crustal Structure, Dimensions, and External Consequences. Reviews of Geophysics, 32(1), 1-36. Ferns, M.L., McConnell, V.S., & Madin, I.P., 2010, Geology of the Upper Grande Ronde River Basin, Union County, Oregon. OR Dept. of Geology and Mineral Industries Bulletin 107. Kraus, M., 1999, Paleosols in clastic sedimentary rocks: their geologic applications. Earth-Science Reviews, 47, 41-70. Pierce, K.L., and Morgan, L.A., 2009, Is the track of the Yellowstone hotstpot driven by a deep mantle plume? Review of volcanism, faulting and uplift in light of new data. J. Volcan. Geotherm. Res. 188(1-3), 1-25. Retallack, G., & Bestland, E., 2000, Eocene and Oligocene paleosols of central Oregon (Special Papers. p. 192). The Geological Society of America. Schwartz, J.J., Snoke, A.W., Frost, C.D., Barnes, C.G., Gromet, L.P., Johnson, K., 2010, Analysis of the Wallowa-Baker terrane boundary: Implications for tectonic accretion in the Blue Mountains province, northeastern Oregon. GSA Bulletin, 122, 517-536. Sheldon, N., 2006, Using paleosols of the picture Gorge Basalt to reconstruct the middle Miocene climatic optimum. PaleoBios, 26(2), 27-36. Sheldon, N. D., & Tabor, N. J., 2009, Quantitative paleoenvironmental and paleoclimatic reconstruction using paleosols. Earth-Science Reviews, 95(1-2), 1-52. Takeuchi, A., Larson, P. B., & Suzuki, K., 2007, Influence of paleorelief on the Mid-Miocene climate variation in southeastern Washington, northeastern Oregon, and western Idaho, USA. Palaeogeography, Palaeoclimatology, Palaeoecology, 254(3-4), 462-476. Tolan, T.L., Martin, B.S., Reidel, S.P., Anderson, J.L., Lindsey, K.A., Burt, W., 2009, An introduction to the stratigraphy, structural geology and hydrogeology of the Columbia River Flood-Basalt Province: A primer for the GSA Columbia River Basalt field trips. In O’Connor, J.E., Dorsey, R.J., Madin, I.P., (eds), Volcanoes to Vineyards: Geologic Field Trips through the Dynamic Landscape of the Pacific Northwest, GSA Field Guide 15, 599-643. Wignall, P., 2001, Large igneous provinces and mass extinctions. Earth-Science Reviews, 53, 1-33.